PLEASE USE THE VICTORY BLVD and MASON ST. entrances for Supercar Sunday. The physical address takes you to the far side of the campus. We are in the main lot off of Victory Blvd. Lot 7. At Supercar Sunday you may not market any products or services without the express consent of Dustin Troyan. There are no exceptions. You may not set up any displays, hand out any marketing materials of do any general marketing. To contact Dustin you may email him at Dustin@connectedmediagroup.com. 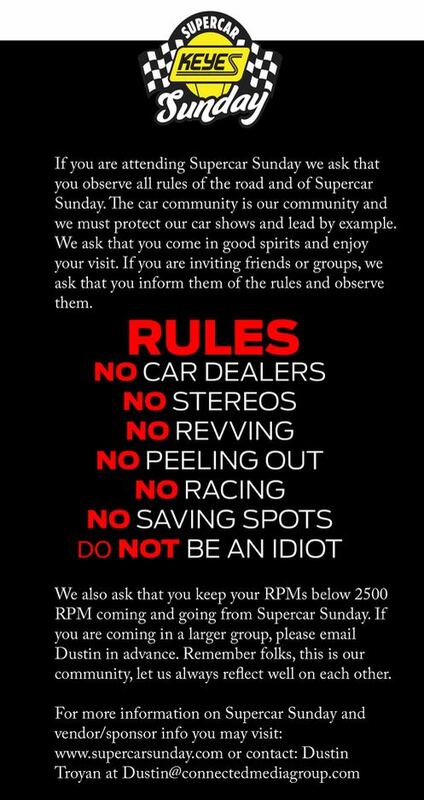 No car dealershps/brokers are allowed to display cars as it is Keyes sponsored event. Supercar Sunday is a registered Trademark (TM) and Copy Right (C) of Connected Media Group LLC. The name “Supercar Sunday” may not be used without written, express permission.